This week is Deaf Awareness Week. 1 in 6 people in the UK have some form of hearing loss, and about 800,000 are severely or profoundly deaf. There are approximately 45,000 deaf children in the country. Statistics are taken from Action on Hearing Loss. There are approximately 50,000 people in the country for whom British Sign Language (BSL) is their first or preferred language. 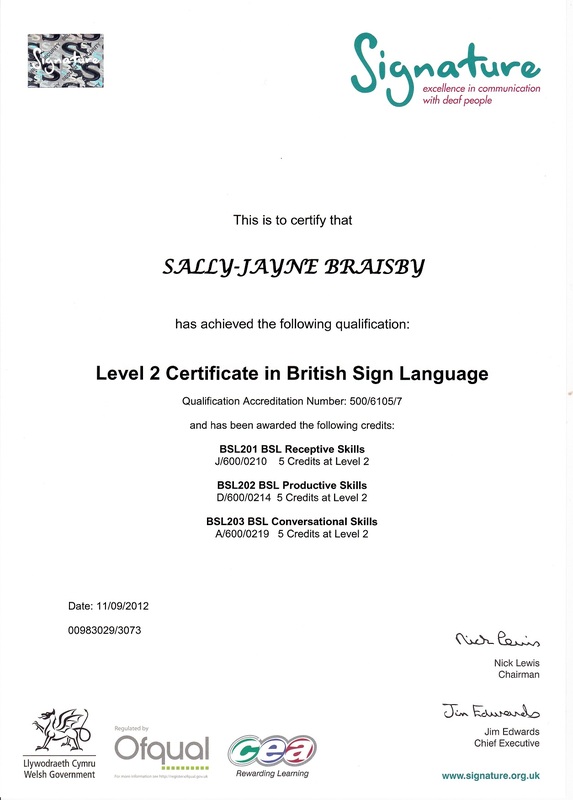 I have achieved my level 2 certificate in BSL, and this year I have been privileged to spend a few days observing Teachers of the Deaf at work in a school for the deaf, followed by a few weeks working as a supply teacher in the school. One thing I have become really aware of while working in this school, is the number of online educational games where the “reward” for a correct answer is a silly noise. Or where the only way you can tell if the answer you input is right or wrong is by a clapping or booing sound before the next question comes up. This is, obviously, completely lost on the children I have been working with. My wish for Deaf Awareness Week is for educational games designers to become more Deaf aware and to make the rewards for correct answers more visual. There’s little that says “Christmas” more than a pantomime (except Noddy Holder shouting “IT’S CHRISTMAS” of course) and last night I went to a pantomime for the first time in years. This though, was a panto with a difference. It took place at my local deaf club, and all the cast were deaf so the whole thing was done in sign language. Ian and I were really unsure what to expect when we bought our tickets and our biggest worry was that we wouldn’t understand any of it. We needn’t have worried: the cast were brilliant. Their comedy timing was much better than many trained actors, and because pantomime and BSL are both so visual, the combination worked really well and we actually understood very well. They also seemed to have thought about the fact that lots of people who went would be people like us, who were learning BSL and who thought this would be a great opportunity to practise. They included some elements of teaching/explaining new vocabulary, but because they built it so cleverly into the plot it didn’t seem contrived at all. There was a group of interpreters there for non-signers, but we found them to be more of a distraction than a help – sometimes their words didn’t match the signs; sometimes their words didn’t even match the signer for example they were saying the Queen’s words while the King was signing. 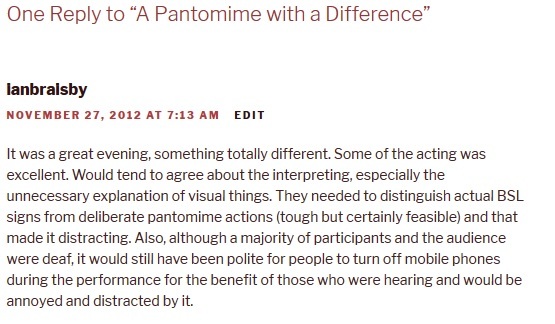 I can’t criticise them because it takes years of training to be a BSL interpreter, and interpreting a play is a very specialised area within the field of BSL interpreting, and these were just volunteers. To make their job even more difficult, I think that only the plot of the play had been decided; the performance itself had a very ad-lib feel to it so they wouldn’t have known the exact signs they had to interpret until they saw them. Taking all that into account, I think they did a great job. If I could offer a little constructive feedback, it would be this: often less is more. Interpret the signs by all means, but facial expressions and actions can be understood by everybody so statements such as “I’m opening the door now to see if anybody is listening”, and “I’m sitting in the chair and wriggling about a bit because it’s not comfortable” could be dropped, giving more time to decide how to interpret the actual signing parts. We really enjoyed it though, and would definitely go to another one. However, next time, I would take ear-plugs for a more authentic experience. I would recommend it to anybody who is looking for something a bit different to do. There’s another chance to see it on Tuesday 11th December in Dudley. The last few weeks have been language-filled. Over the summer holidays I taught, alongside a colleague, on a subject knowledge enhancement course at Newman University. The aim was to take people from long-forgotten GCSE French up to AS/A’ level standard in just two weeks. It was fun. It was also exhausting! Most of all though, it was rewarding to watch the final presentations to see how far they had come in a fortnight. After that there was just one weekend to switch off before starting my next job, which was a 7 week contract at the Blue Coat School teaching French to years 2 and 6 and Spanish to years 4 and 5. That certainly kept me on my toes as lessons of the same language weren’t always blocked together, and lessons were quite short so I had to switch backwards and forwards between French and Spanish very quickly. The school staff and children were all lovely and I shall miss working there. Then over the half term holidays was the Language Show, followed by writing up notes on all the things I’d learned to I can put them into practise, and some proofreading for my husband, who is a translator. So – what’s next? Well, first of all a “rest” – I shall “relax” by looking into 11+ tuition, catching up on my BSL homework and hopefully doing some further studies about dyslexia). After that…. I’ve had a few enquiries for French and Spanish GCSE tuition so I shall see if I can convert some of those enquiries to bookings. I shall also be continuing with private tuition for maths and English SATs. I have a waiting list at the moment, so I shall take a few more of those on. If possible I’d also like to get some work experience in a Deaf school to put my BSL to use, so I shall try to find somewhere to let me volunteer. Other than that…I’m open to offers! If you need a teacher or tutor for maths, English, languages or dyslexia teaching then contact me via my website. This year I enrolled in a British Sign Language evening class. I’ve already passed levels 1 and 2, so now I’m beginning Level 3. It’s always strange to be back in the class part of the classroom rather than in the teacher role, and every time I do it I rediscover how it feels to be a child in class. The teacher puts hand-outs in front of us, and of course I pick it up and start reading it. Oops – now I’ve missed the teacher’s signing so I don’t know what we’re supposed to be doing. Perhaps I’d better ask the person next to me. Uh-oh – caught talking! Later we have to give presentations to the rest of the class. As soon as we are told to prepare, all my ideas fly straight out of my head and I can’t think of anything to say. By the time I have enough ideas to begin, it’s time to stop writing and begin presenting one by one. I try to write and watch at the same time, but that’s impossible. Reluctantly I put my pen down, but as soon as the first presentation is over, I start writing again, as quickly as I can before the second person is up. When it’s my turn I’m not really happy with what I’ve done. I know I can do better, but it’s too late – the teacher has made her judgement about my ability. At the end of the lesson the teacher starts to explain our homework. She’s signing really fast and I miss a bit. Oh no! I’ve missed a bit! What did that sign mean? I think I recognise it but I just can’t remember. Oh no! I’ve been worrying so much about the bit I missed that I miss a bit more. I try to concentrate, but I’ve missed so much that I’m really lost now. I look around the room and the rest of the class are smiling and nodding. Have they understood it all? Am I the only one that didn’t? Does that mean I’m stupid? I can’t admit now that I didn’t understand or the whole class will know that I’m the stupid one. I start smiling and nodding along with the rest of the class. The teacher finishes signing and asks if there are any questions. I hope someone else asks her to explain it again, but nobody does so I shake my head like the others. She asks if we all understood and I nod. I’m sure she’s going to ask someone to repeat it (that’s what I’d do) and I panic in case it’s me she picks. She doesn’t though – she just dismisses the class. I still won’t be doing my homework as I still have no idea what it is, but at least I know I won’t be the only one. I’ll certainly be more understanding of my class in future, although I still don’t have a solution to stop them daydreaming. If anybody has any suggestions please do leave them in the comments below. I’ll try them on myself first to see if I can concentrate more!